In multivariable analysis of the primary outcome, CT-P13 (biosimilar) was equivalent to infliximab reference product (RP) (HR, 0.92 [95% CI, 0.85 to 0.99]). 1147 patients in the RP group and 952 patients in the CT-P13 group met the composite end point (including 838 and 719 hospitalizations, respectively). No differences in safety outcomes were observed between the 2 groups: serious infections (HR, 0.82 [CI, 0.61 to 1.11]), tuberculosis (HR, 1.10 [CI, 0.36 to 3.34]), and solid or hematologic cancer (HR, 0.66 [CI, 0.33 to 1.32]). 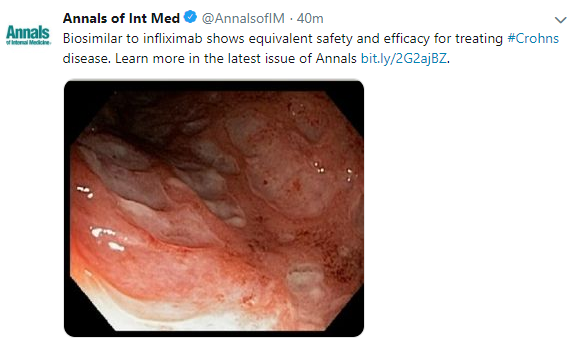 This entry was posted in inflammatory bowel disease and tagged biosimilar, infliximab by gutsandgrowth. Bookmark the permalink.